Melissa Ruffos’ second grade class is pictured with the special guests at Parish Elementary School’s Veteran’s Day program. Seated in chairs, left to right and representing VFW Post 136 in Williamstown are: Bill McCullagh, Joseph Bruggeman, Grover Britton, Doug Kaine, Chairman of the Oswego County Legislature Barry Leeman and Robert Kennedy, VFW Post 136. Pictured with the veterans are students in Melissa Ruffos’ second grade class at Parish Elementary, Principal Michael McAuliff, back left, and Librarian and coordinator of the Veterans’ Program Sharon Amyotte, back right. Amyotte holds the proclamation given to her and the school by the Oswego County Legislature for their outstanding recognition of local veterans. 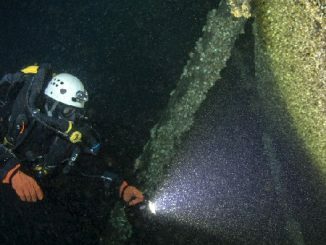 Ruffos is standing in back, center right. Altmar-Parish-Williamstown’s (APW) Parish Elementary School (PES) held a very special Veterans’ Day program at the school to honor those men and women who have served in the Armed Forces. 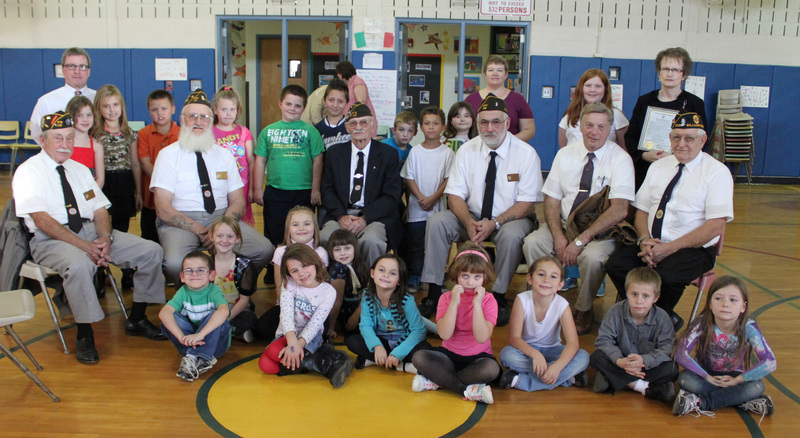 The program featured members of the Williamstown Veterans of Foreign Wars (VFW) Post 136 who, as guests of honor, sat in chairs in the center of the gymnasium surrounded by the students and staff. Many other veterans were invited to attend the recognition program by students at the school. The ceremony featured introductions of all veterans in attendance by their special student member, and a special proclamation given to the school by Barry Leeman, Chairman of the Oswego County Legislature on behalf of Oswego County to recognize the efforts of the school to promote Veteran’s Day for their students and community. The proclamation was read by Leeman and presented to Sharon Amyotte, coordinator of the annual program at the school. Students from the APW High School Chorus and Band programs were also on hand to take part in the tribute to area veterans. The chorus group sang the National Anthem, and the saxophone ensemble played “Stars and Stripes” for all to enjoy. PES students provided some additional musical entertainment singing “If You Love Your Country, Thank a Vet” and “Proud to be an American.” Also entertaining the guests of honor were other special performances by Parish students. Many notes and posters from students decorated the gymnasium thanking veterans for their service to our country.